Many construction industry employees in Brooklyn are surprised to learn that New York law prohibits them from suing their employer or a fellow worker following an on-the-job injury, even if the negligence of an employer or fellow worker clearly caused the accident. Why are the prohibitions in place? Because lawmakers sought to promote workplace harmony by limiting lengthy legal battles between workers and between workers and employers. The father-and-sons team at our Brooklyn law firm have handled hundreds of personal injury claims, including numerous third-party claims following construction site accidents. 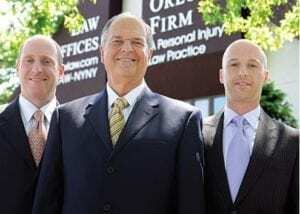 Contact the experienced Brooklyn third-party claims attorneys at The Orlow Firm for more information regarding third-party claims. We offer free initial consultations and operate four offices across New York City for your convenience. We can go to you if you cannot come to us.